February 04, 2019 at 1:54 pm. The No. 6 Kentucky Wildcats saw themselves trailing Florida, 42-31, with 14 minutes to play in Saturday’s 65-54 win over the Gators. 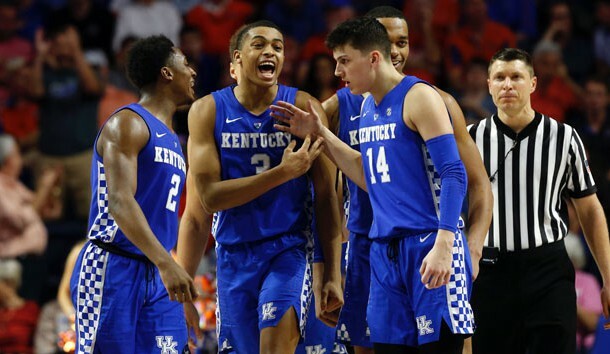 It was time for the defense to kick in and for talented big man PJ Washington to take center stage. Washington, who finished with 15 points and 12 boards, ignited a 10-0 Kentucky run when he went through the middle of Florida’s zone press for a dunk. This was just after he scored five of 10 points in another 10-0 Wildcats surge that cut the 42-31 deficit to 42-41 with 9:14 to go. Washington may have even given the Wildcats the lift they needed when he was able to gather the ball after missing the second of two free throws. With his score, it was like a call to arms for the Wildcats, who responded. The 6-8, 228-pound forward from Dallas maintained control of the game and led by example. He used his physicality to attack the glass against a Gators team that struggles against physical play in the post. As he controlled the court, his teammates saw a side of Washington that has developed and has taken an even higher flight in the three previous games. Washington had gone 25-of-47 from the field and had averaged 22.3 points per game and 10.3 rebounds in the previous three games. His confidence was evident with the game on the line and Kentucky facing that 11-point deficit. “I think when we see a guy like PJ who has been here before – he works hard every day in practice – us young guys can look up to him and just take his lead and follow his lead,” said Herro. 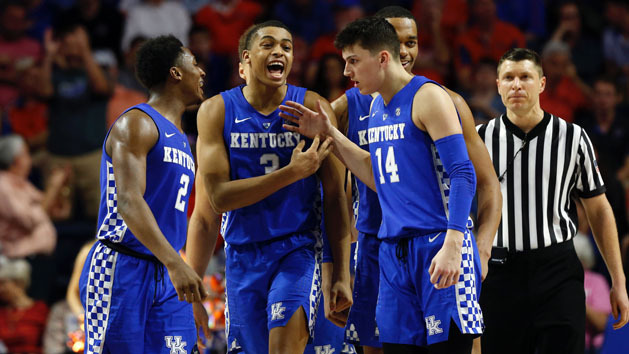 In the stretch where the Wildcats finally caught Florida, Keldon Johnson made on a three-point field goal off the right baseline which gave them a 50-48 lead – their first since 22-21 late in the first half. Johnson finished with 10 points and eight boards, but struggled all afternoon as he finished 4-of-13 from the field. Kentucky’s defense came on the scene in a major way as well. The Wildcats pushed Florida’s offense further out and the Gators stagnated on the perimeter. Ball movement was at a minimum and there was still nothing coming out of the post positions to loosen Kentucky on the perimeter. From the 13:59 mark of the second half when Jalen Hudson scored in the lane, Florida made only 5-of-19 field goals. Two of those were by KeVaughn Allen – inside of a minute – as the game by then was already virtually decided.